After over 60 software releases and almost 9 years, Parliant has announced the end of line for its Mac telephony product line, including PhoneValet. Due to supply constraints, it is no longer possible for Parliant to produce the Telephone Adapter hardware required for its line of phone products. After six major versions of PhoneValet, Parliant will focus the company's efforts around its growing iOS software development business, including consulting iOS programming for "Fortune 500" companies as well as the Conference Companion line of paperless conference applications for iPhone and iPod touch devices. Parliant discontinued its Mac telephony products in May 2011 and has provided technical support for a full year after discontinuation. 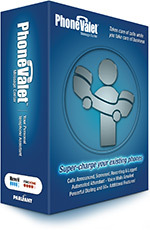 Technical support is no longer available for PhoneValet products.